As supreme commander of the U.S. Occupation of Japan, Gen. Douglas MacArthur had his share of faults. His temper rattled members of his staff and an open disdain for authority enraged his boss, President Harry S. Truman. But if the rooms and offices in Japan where MacArthur sequestered himself offer any insight into his character, neither sloth nor material excess have a place on the list of his shortcomings. 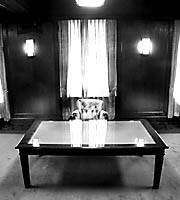 Meticulously preserved, the Yokohama hotel suite where MacArthur spent the first days of the 1945-52 Occupation and the Tokyo offices where he established his General Headquarters are Spartan in their simplicity, clearly indicating the no-nonsense, workaholic nature of their former tenant. That’s hardly surprising: With a new constitution to draft and political tensions coming to a head in Korea, the general would have had little time for frivolity. 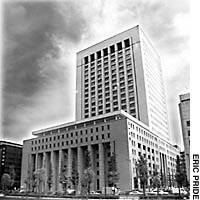 Perhaps most symbolic of MacArthur’s distinctive management style is the wooden desk that dominates his sixth-floor office in the Dai-Ichi Mutual Life Insurance Building. Dai-Ichi Mutual was commandeered by GHQ during the span of the Occupation and returned to the company at its conclusion. The desk, taken over from former company President Taizo Ishizaka, was MacArthur’s main workstation. Here he penned important speeches and inspected some of the defining documents of the Occupation. And yet, visitors are surprised to learn, there aren’t even any drawers. MacArthur’s first base in Japan was Yokohama. He flew onto a landing strip in Atsugi, Kanagawa Prefecture, on Aug. 30, 1945, brushing aside warnings that die-hard kamikaze living in the area might attack his C-54 airplane in defiance of Japan’s surrender. 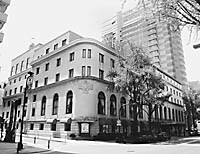 Puffing on his trademark corncob pipe, the commander strode from the plane onto the sweltering tarmac and glanced around briefly before rumbling off in an ancient American Lincoln to Yokohama’s Hotel New Grand — one of the few structures in the port town that had survived America’s bombing raids. At only 64 sq. meters, Suite 316 was humble as chief-executive abodes go. 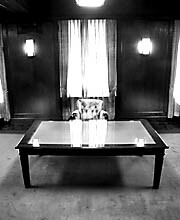 The main features of the living room were a writing desk, a vanity table and two mirrors. There was an adjoining bedroom and toilet. That was pretty much it. Yet as unassuming as Suite 316 was, history was made there. 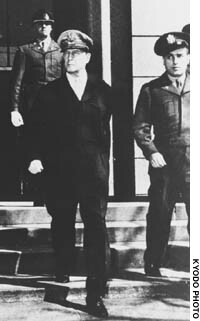 During his two- or three-night stay, MacArthur went through drafts of his address marking Japan’s official surrender on Sept. 2, the speech that set the tone for the early years of the Occupation. There was constant concern about MacArthur’s safety at the hotel. In his memoir, “Reminiscences,” the general describes a military secretary on one occasion worrying aloud whether a steak served to MacArthur in the dining room may have been poisoned. “No one can live forever” was his breezy response. Despite the general’s outward calm, however, hotel records note that he arrived at the hotel armed with a pistol as precaution against attack. 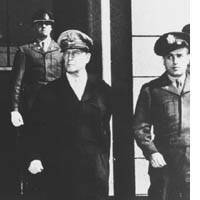 After wrapping up the proceedings of Japan’s surrender, MacArthur moved into the U.S. Ambassador’s Residence, located behind the embassy in Akasaka in Tokyo’s Minato Ward, which had been vacant during much of the war. MacArthur was soon joined by his wife, Jean, and son, Arthur. “We’ll do simply here,” he told Jean. “This isn’t a time for splendor.” His main aesthetic flourish was to order much of the house’s interior painted Army green. Having dispatched with decor, MacArthur plunged into a routine: Wake up at 7, say morning prayers, eat breakfast, read incoming wires, start work at GHQ at 10:30 a.m., lunch, nap, keep on working — sometimes as late as 1 a.m. He barely ever left Tokyo. MacArthur ran GHQ like a military headquarters, placing each official in a strict channel of command. Of course, his word was law. “I was scared to death of him,” recalled Beate Sirota Gordon, 78, in a recent interview. As a young woman, Gordon was employed at GHQ to write constitutional guidelines — including those for women’s suffrage. 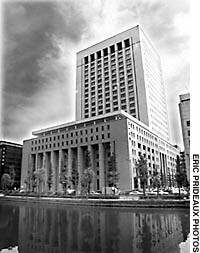 The pillars that line the Dai-Ichi Building today, refurbished in 1995, look just like the ones that sheltered Gordon during the Occupation. The New Grand room in Yokohama is also largely unchanged, and history buffs can stay there for 60,000 yen a night, plus tax. But nothing stays the same forever. The Army-green walls at MacArthur’s old home — now the residence of U.S. Ambassador Howard Baker — were long ago repainted in hues a bit more suited to decades of peace.